Microsoft has removed HomeGroup featured in Windows 10 April 2018 Update. Learn this article for HomeGroup alternatives in Windows 10 V1803. Many users were relying on HomeGroup in their daily computing usage. Those users are now feeling helpless with HomeGroup. Such users are regularly posts queries about how to share files and printer now, on the community forums. For all those users, this post is the answer. You can individually manage file and printer sharing now onwards in Windows 10 V1803 or later, as mentioned below. 1. Open Settings app and go to Devices > Printers & scanners. Click on the printer you want to share and click Manage. 2. Then click on Printer properties. 3. On the printer property sheet, switch to Sharing tab and click Change Sharing Options button. 4. Finally, check Share this printer and give this share a name so that other devices recognize it. Click Apply followed by OK. In this way, you can share printers on the network. 1. To locally share files(s), simply right click on the file(s) and select Share. 2. This should open the Share charm and you can even share the file(s) using sharing apps that you downloaded from Store. 3. In case if you want to share file(s) on the network, right click on it and select Give access to > Specific people. You can then add the network locations to share the file with. So this is how you can share files on network now. If you still want HomeGroup feature, you can downgrade to V1709 or make a clean install of it. 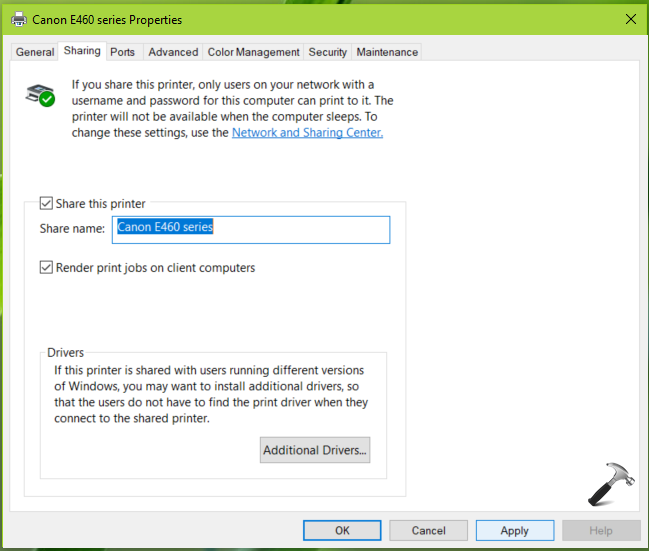 Related: How to manage file and printer sharing in Windows 10. I’ve tried this but I’m unable to even see the other computer in the specific people selection. I have 2 computers using quickbooks. when I go to computer 1 which has homegroup active computer 1 can see my computer 2. Computer 2 does not have homegroup s computer 2 cannot see computer 1. Is this clear?? ^^ Because Computer 2 is on V1803, so HomeGroup won’t work on it. Thank you for your quick answer. The explanation you give looks reasonably simple at first glance and I have tried it to the point where I am asked which specific person is allowed to share. Sorry, but I still do not understand how this works. I declare a directory DIR in machine 1 to be shared by “Everybody”. When I go to machine 2 , I stiill cannot acces to tthe machine 1 icon and I do not know wherre will appear the view of the shared directory DIR. If I had given a more specific name, I do not understand how several computer can share user names which, I believe, are local to each computer. You speek of mail. I have to exchange files between a development machine where data are created with the proper development tools and a process machine where data are executed. This second machine beeing a real-time process machine has no mail system. To summarize, I am still completely lost. Please Mr Kapil, I am still lost to share files between 2 computers. I read your article HomeGroup Alternatives In Windows 10 V1803. after I have granted shared acces to a directory in computer 1, I get a link (say, \\D:\SharedDir). Where do I put or see this on machine 2, to be abble to effectively read the content of SharedDir? I tried to do this in the File Explorer and nothing works. I tried the above, but still cannot find the additional computers to share with. We share most of our documents etc within our office. how do you actually find the name of the other computers to “share” with? I used to link my two computers using “workgroup” instead of “homegroup”. I found that homegroup was not reliable. Since this upgrade to 1803 I have not been able to get the two computers to share files. File explorer (on both computers) shows the two computers but Computer 1 will not access computer 2. Computer 2 will access Computer 1 but only will allow access to public files. The explained process I know very well, regardless, I still see no network PC’s. I run 3 Windows 10 PC’s, a handful of devices, eg. Xbox, TV etc and a tablet. Now 2 PC’s can see and access my Media PC but I’m still unable to write, only read files. My Media PC sees nothing and the other 2 can’t see each other. Media streaming devices appear in the network but I don’t stream myself so, other than allowing streaming, have not set anything up. Server is running Win 10 Pro Ver. 1803. Homegroup removed with update. Media is running Win 10 Pro Ver 1803. Homegroup still available in Control Panel. Gaming is running Win 10 Pro 1803. Homegroup removed with update. This PC also refuses to remove the update message when shutting down or restarting. Have worked with Windows since ’93 and Win 3.1 with varying degrees of success but have always managed to get round issues, yet this time it’s got me. All PC’s are set up identically, so why do they either see each other or not and not some weird halfway house? About time someone at Microsoft got their finger out their arse, unacceptable in 2018, everyone uses multiple devices on their home networks, yet the barrier to fluidity is yet another Windows flaw. Exasperated to say the least! There is no proper solution from your end. Even we face the same issue in my laptop. I cant see any other shared PC’s in the new laptop. Everyone is asking the same. But from Microsoft there is no proper reply. #WINDOWS IS THE VIRUS. I have used windows since 1993. I have spend literally hundreds of hours, sometimes in chunks of 24 hours at a time (in a support role) troubleshooting windows problems, almost always as a result of flawed updates. During the same interval (since 1993) I have spend a total of approximately 4 (four) hours troubleshooting and restoring as a result of viruses. If you agree with me that #WINDOWS IS THE VIRUS, tweet that out. Maybe if that message goes viral, we can get Microsoft’s attention. I can see everything on my network except my wife Imac desktop that I was seeing before the change. What do I have to do to get this back? I have tried other solutions being recommended to no avail! So I just type in “grandma” where I put who to share stuff with right? Or would some instructions on that kill you? It’s no useful since the pc’s can’t see each other. You share a folder or a printer but the other pc can’t see it, whats the point? I have tried everything and cannot share files between PCs this fix did not fix anything… Why did Microsoft remove Homegroup? This “alternative” method is same exact method I’ve seen posted on about 50 different websites and forums and it does not work. I have 3 Windows 10 pc’s that I share files and printers on and since the update they do not even see each other. I have shared everything and gone through the process you have listed above over an over to no avail. Is there any other way? We should not be going backwards in technology and making things harder to connect to each other. Open Control Control Panel\All Control Panel Items\Network and Sharing Center. In all networks turn on or off password protected sharing according to your needs. In guest or public do what you want to do. I am very upset with Microsoft. I just purchased a new computer with Windows 10 and after all of the updates were installed (which included 1803) I now no longer have a HomeGroup. This really put a halt to all of my file sharing. I paid good money for windows 10 that had HomeGroup and Microsoft stole it from me with their update. They aught to be prosecuted for theft. None of these instructions worked for me. Yes – I have flagged all the relevant files & folders to be shared with full read/write authority to “everyone”. My userid has administrator authority too. Win 10 will NOT allow files to be accessed from my desktop to my laptop. The “Share” option in Edge is greyed out and inaccessible. My laptop can “see” my desktop and vice versa but neither computer is able to open files saved on the other. So…. Windows 10 MAJOR FAIL. As usual Micro$oft delivers garbage to it’s customers and does nothing to fix the problem. I assume this is a dastardly plan to force all users to use Google OneDrive. Nope. I don’t give a crap what they want. I am not copying sensitive personal files up to some nebula where I have zero control over security. I do not care what they say about the security of OneDrive — it’s a nice juicy target for hackers therefore it is of absolutely no use to me. My three home computers can “see” eachother in File Explorer / Network as “Media Devices” which apparently access eachother’s music files (and videos). While I respect Microsoft’s appreciation of fine music, I cannot fathom why this function can’t extend to Documents. Who designs this stuff? I mean seriously, what is going on? Is this a plot to get all my documents into OneDrive? Class action, anyone? ^^ Please use Feedback hub to submit your opinion to Microsoft. I have done as you suggested twice now. I can get my two Windows 10 workstation PCs to talk to the file sharing Windows 10 machine until there is another Windows 10 update installed. At that point the machines are unable to access the file sharing machine. What can be done to keep the file sharing in place so an update doesn’t kill it? IT IS VERY FRUSTRATING IN AN OFFICE ENVIRONMENT TO LOOSE ACCESS TO YOUR WORK FILES!!!! I’m trying to figure out how to get around the fact that HomeGroup is no longer available in Windows 10. All I want to do is share files between my desktop computer and my laptop computer which are both on the same network (router). It seems a simple thing to do, but with HomeGroup gone, I cannot seem to figure this out!! Why did they change this? Close Services snap-in and see if sharing works now. I have been fighting this Network connection problem since the beginning of the year. Before that I used networking for over 20 years without a problem. I tried every fix I could find but none work including this one. I have 6 computers in my network and every time I restart one it is dropped from the network unless I do a network reset. This is quite annoying having to go through the extra step of a reset with every restart. So when I turn a computer off at the end of the day when I start it up again the next day I have to go through the same ritual once more and do a Network reset.